Combining facial recognition technologies gathered from Panasonic's Lumix camera line and commercial security products, the mirror is able to track and assess your face, and give cosmetic recommendations based on your look. It'll then put a real-time overlay of your face onto the mirror, complete with all manner of blush-inducing eye-shadow and lipstick combinations. Paired with bespoke software, the camera can also spot lines and wrinkles on your face, and adjust its application appropriately, and even show you how the make-up will look under different lighting conditions. Panasonic also sees future versions of the mirror becoming able to spot skin complaints, and suggest treatments that would fix it and give you a healthy glow. 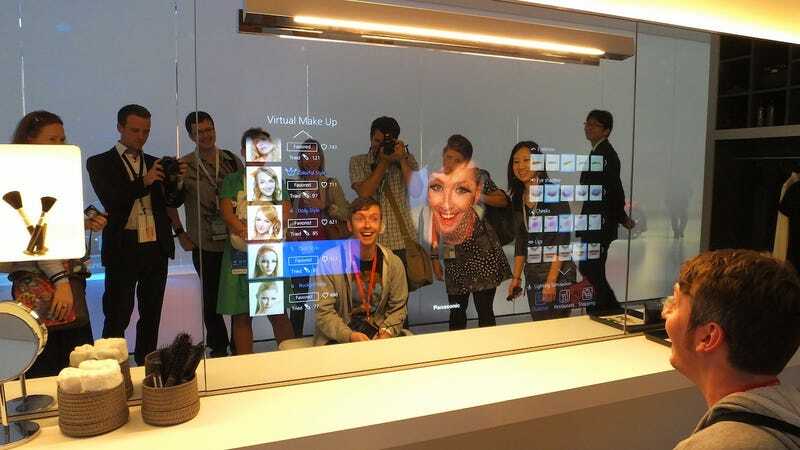 Ready to be commercially rolled-out, Panasonic hopes to sell the mirror through to cosmetics retailers like Boots and Selfridges, with its transparent, frame-like UI suggesting products stocked by each store. It has also suggested that it could be scaled down for the home, though wouldn't state when you may be able to buy one. Until then, to try out a new style you'll have to mess about with your mum's make-up bag and keep a couple of wet wipes handy.